Last month I tried all three fragrances from Neela Vermeire Créations in one sitting, one after the other. Trayee made me think, and Bombay Bling made me smile, but Mohur made me swoon a bit. Kevin has already written an excellent review of Trayee and Bombay Bling, in which he mentioned that Mohur wasn't quite his type; however, it is exactly my type, so I'm happy to follow up with a review of this fragrance, which is described as "a combination of opulent moghul rose perfumes and a distinguished spicy leather bouquet." My knowledge of Indian history is woefully limited, and my impressions of the British Raj period have been gathered mainly from Merchant-Ivory productions, but the idea of a rose-based fragrance combining western and eastern influences appealed instantly to me. Having tried Mohur, I can now imagine it being worn by either a Mughal Empress or the elegantly gowned wife of a British Viceroy. I'll start by describing it as a spicy-gourmand-incensey rose, which gives you an idea of its various aspects. Mohur opens with a greeting of warm cardamom, delicate saffron, and buoyant black pepper. However, its spicy side is soon balanced by a sweeter heart. 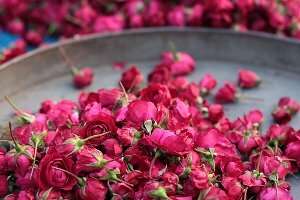 The creamy almond and powdery aubepin (hawthorn) flower notes mix with a bright pink rose in a way that reminds of me of certain Indian desserts I can never resist, like gulab jamun or rose-flavored falooda. Yes, there's oudh in the composition, but it's a very sheer oudh that brings out the spice of the other notes, rather than smothering them in its sweaty embrace (as most oudh fragrances do on my skin). The vanilla and amber stay in the distant background, but the sandalwood makes an appearance in the dry-down, with a hint of leather that laces the base notes together. Over my days of testing this fragrance, Mohur has never seemed exactly the same twice. One afternoon, it hovered around me like a shimmery cloud of gold dust and rose petals, and lasted so long that I could still smell it on my arms after a full night's sleep. Another time, it seemed to fit itself snugly to my skin in a much more subtle, spiced-wood way. I'm not sure what caused the difference, and it doesn't really matter. For me, Mohur feels like an intricate story that stays interesting with each re-telling, and it keeps me coming back for more. Neela Vermeire Créations Mohur was developed by perfumer Bertrand Duchaufour. It is available as 55 ml Eau de Parfum ($250) through Luckyscent. It can also be purchased through the Neela Vermeire website, in a discovery set of the line's three fragrances (€75 for three 10 ml bottles). Note: top image is Gulab by Meanest Indian via flickr; some rights reserved. Lovely review. I’ve had the sample set sitting on my bathroom vanity for about a month now. Shame on me! Of course, I’m going in there right now to put some on. However, I didn’t realize just how expensive this was when I ordered the sample set. Makes me almost hope that I don’t love it! Do give it a try! I’ve been enjoying sample vials, too… the price for a full bottle *is* high, although no more so than other niche/independent brands, and it *is* good quality! Nancy, the patchouli isn’t one of the stronger notes…it’s in there, but it’s very blended and subtle. That’s fine with me, since I don’t enjoy most heavily patch-y rose compositions! Jessica – what are some other heavy rose-patch fragrances? I have and wear Voleur de Roses, but the voleur really got away with the roses in that one as all I get is patch and plum. R, I’m thinking of Etat Libre d’Orange’s Rossy de Palma (Eau de Protection), and something from Juliette Has a Gun… oh yes, Lady Vengeance. And perhaps Paestum Rose. But I do love Voleur… it smells like plummy roses and real, damp earth/soil to me! Thanks so much! I’ve meant to try Paestum Rose for ages and just haven’t gotten around to it. Will try it and the others now. Lovely lovely photograph. I could just roll in those rosebuds. Mohur is somewhat flat and heavy on me. I wonder if it’s the sampling problem from a dab rather than a spray. I’d think about ordering a spray set, as I’d so much like to enjoy this line. Oh, that’s too bad! It felt lighter than I would have expected, going by that list of notes. Well, not “light,” exactly… just not heavy! And I do love finding new rose photos to use! I am saving my pennies for the Discovery Set – all three fragrances are so consistently delicious that I could never choose just one. I think my favourite is Trayee, though Mohur seemed to me the most feminine as well. Littlemoron, it *is* difficult to choose… all three fragrances are unusual and very well-done! What a lovely review! You make this sound scrumptious. Must sniff. A, I think you would enjoy it, because it does have plenty of spice/wood/incense to balance out the rose/sweet notes! The only rose I like is Amouage. I figure it SHOULD be there because it’s Amouage, ha. I never try or want to try rose frags. I need to open my mind. This sounds like right up my alley. Ah… Amouage! I’m still trying to forget my desire for a bottle of Library: Opus III… anyway, you don’t necessarily need to love rose in order to enjoy Mohur: the rose is there, but it’s surrounded by so much interesting spice-resin-cream-wood that it doesn’t dominate. And, conversely, someone who only loves dewy, garden-fresh rose fragrances might not care much for this one. Mohur is gorgeus! First I was more intrigued by Trayee but Mohur has been steadily growing on me. My samples are almost all used up, so I’m planning on a discovery set soon! Well, there’s another one added to my must try list. The notes sound wonderful. I’ve been thinking about rose scents lately. Sounds like the discovery set is the way to go though. I’m going to have to reread the reviews on the others now. Poodle, Kevin’s review of Tralee and Bombay Bling is great, and there have been some interesting write-ups on other blogs, too. Happy reading! Very nice review, Jessica! I tried Mohur recently and fell for it hard. I like what you say about it never seeming exactly the same twice. I experienced and loved the “shimmery cloud of gold dust and rose petals” (love that! ), the softly spiced and “snug” woodiness, and the creamy Indian dessert aspect. I think I may have found my HG rose fragrance! Hi, H! I’m wondering whether it includes a larger-than-usual percentage of natural ingredients, which could make it feel more “changeable”… or whether I applied more one day and less the next, or whether my body temperature was fluctuating! In any case, it still smelled good, even as it morphed! This sounds wonderful, and I’ve been neglecting that wonderful exploration set – now I know what I’m going to try this weekend! Right now I’m deciding on Bombay Bling or Trayee as my scent of the day…! Lovely picture, lovely review. The notes definitely are intriguing me a bit. The bottle looks very vintage to me. However, that particular vintage look doesn’t appeal to me much..but hey, it’s all about what’s in the bottle! I’d like to sniff! Hi, Omega! The site describes them as “Deco,” so, 1920s-30s-inspired, I suppose? I do like them, and I’m also glad to hear that an atomizer attachment is included! Beautiful review for a lovely perfume, Jessica. When I tested all three Mohur was my least favorite but it’s not that I dislike it – I just like the other two more. But I plan to wear it more in a warmer weather and see if it feels better. It’s interesting to see how everyone has a favorite of the three! As Kevin pointed out in his review, each one has its own personality! If I hadn’t just sprung for the OJ Discovery Set, I would order one from Neela Vermeire right now. I’m not so sure about Bombay Bling, but Trayee and Mohur sound perfect. Duchaufour’s scents seem to agree with me, at any rate. Emily, that OJ sample set is wonderful, too!! I used up most of mine… sigh. They’re all lovely. Mohur sounds beautiful. I’ve been on a real rose kick recently, I’m going to look this one up! Hope you’ve enjoyed it, if you’ve given it a try! I’ve only just tried the Vermeires, and while I’m on the fence about Bombay Bling (for me, that is; it’s just lovely) I adored Mohur. I rarely buy a full bottle of perfume but it shot instantly to the top of my wish list. By the way, I appreciate your great reviews of rose perfumes — I love them, whether they are simple and direct, or the more complex, ornamented ones. Annunziata, thank you for this nice comment! I’m so glad you enjoyed Mohur, too. I still think it’s quite beautiful and unusual, and I encourage non-rose-lovers as well as rose aficionados to try it!